This easy tater tot casserole recipe will become a favorite family dinner. It only has four ingredients - ANYONE can make it! Spray a 9 x 13 inch casserole dish with cooking spray. Open your ground turkey and press it into the bottom of the casserole dish. Open your can of cream of mushroom soup and spread across the ground turkey. 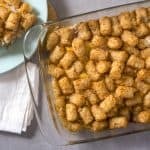 Pour the tater tots out evenly across the top of your casserole. Stick in the oven and bake for 45 minutes covered with aluminum foil. Remove the cover and bake an additional 15 minutes.